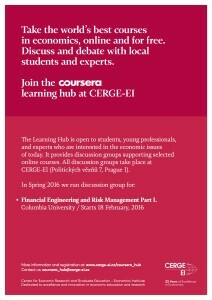 18/2/2016 marks the start of discussion group associated with Financial Engineering and Risk Management Part I. course, which follows free Coursera Course. Discussions are taking place at CERGE-E (Politických vězňů 7, Praha 1), in English. 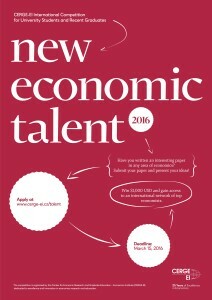 CERGE-EI announces third annual New Economic Talent competition. International, two-round-long competition is open of students of bachelor and master programmes and fresh graduates. Works covering economy-related issues in English need to be sent by 15/03/2016. 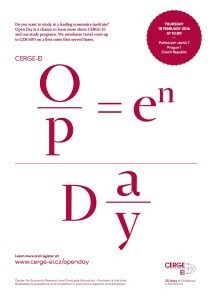 Final round will take place in Prague with grand prize being 1000 $ and entry to interesting CERGE-EI events. 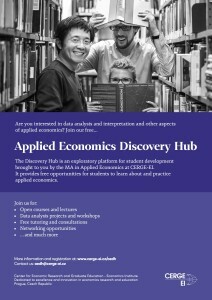 Students interested in applied economics can utilise activities associated with CERGE-EIs Applied Economics Discovery Hub. Intriguing short and long-term courses, workshops, lectures – to put it simply – programme is constantly updated! On 18/02/2016, CERGE-EI organises Open day for those interested in enrolling into their MA in Applied Economics and PhD in Economics study programmes.